Where do I use my Hush voucher code? "Free delivery on orders over £50 and free returns." Hush UK is a company specialising in women's clothes. Hush aim not to be the biggest but the best, with clothes symbolising the good quality and long lasting materials that are perfect for women who like to feel casual and relaxed in their outfits as well as looking good. The Hush brand is unique, with a cutesy, boho yet sophisticated style that offers something for every woman. Whether you're old, young, a stay at home mum or a classy business woman you can find pieces perfect for your fashion needs. Hush’ clothing is aimed at women of all ages. At Hush you’ll find that you can look good without spending ages trying to do so, finding comfort without compromising on style. Hush believe that feeling good in your clothes is just as important as looking good which is why they add their unique touches to make their clothes a comfy, trendy fit that is bound to put a smile on your face. 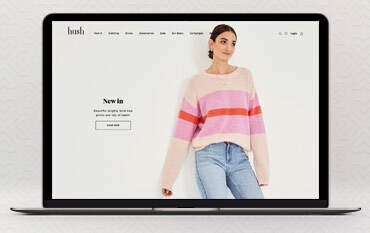 Clothing at Hush is made and designed exclusively for women, their modern, casual pieces are perfect for dressing up a dressed down outfit and are the ideal choice for lightweight, summery outfits. Womenswear at Hush is designed with diversity and a mixture of tastes in mind, tied together with its constant comfort element and laid-back style, that makes its products so unique and cool. At Hush, you can find clothes for day wear, items perfect for summer and chilled out days at the beach as well as basics and nightwear. Also available is a stunning selection of footwear and hosiery products, plus complimentary accessories like bags, jewellery and scarves that’ll make your outfit pop. All items for return or exchange need to be sent back within 21 days of receipt in a resellable condition - unwashed, unworn (except for the purposes of trying on) and with the original tags attached. How can I contact Hush? If you love taking it easy in style you’ll love Hush womenswear - designed to provide maximum cosiness while retaining fashion sense to create a pleasant ensemble you’ll be happy to wear both inside and out. With one of our Hush Promo Codes, you can make great savings on dresses, knitwear, tops, trousers & shorts, jumpsuits, playsuits and much more. Shop around by style and category, or receive a little inspiration from the Hush Look section, where outfits perfect for this season can be found. There are plenty of everyday essentials, plus accessories like bags, hats and jewellery, so you can easily assemble a look that’s as lovely to wear as it is to see. There’s also a great range of footwear, from slippers, pumps, sandals, boots and more, and you’ll be happy to wear them out and about. We are constantly on the hunt for first order Promo Codes for Hush to help you with your money saving. Our experts check dozens of sites for secret codes including NHS discounts, student sites & social media channels saving you time & money!